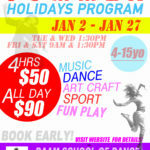 School holidays at DAAM School of dance are filled with heaps of music, dancing, sport, FUN fitness and agility training, endless art crafts exercises and playing. We are specialised in entertaining and educating children at different levels and ages. providing a safe, active, respectful and friendly environment where your kids can be challenged through adventure and fitness. We focus on team work, creative process, personal growth, well-being and self awareness. This program is for children aged 4-15. Our experienced, playful and enthusiastic staff (2 onsite) with Working With Children Check will keep your kids active and entertained during the holidays! The staff-students ratios vary from 1:5 to 1:10 to ensure each kid is always looked after. Trainers are secured in advanced based on booking numbers. Therefore we do not accept cancellations or change of days, so please, to avoid disappointment, be sure of your booking before you commit to us. Thank you for your understanding!